Peter Musurlian, of Globalist Films, debuted a documentary on Peter Fischl three months after Mr. Fischl’s death. 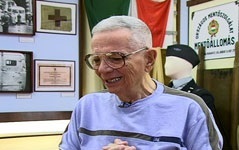 The film, available below, was seen on KLCS in Los Angeles. 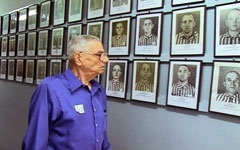 During a June 2007 visit to Auschwitz, Peter Fischl walks by a wall of pictures of Holocaust victims. Peter Fischl visits the memorial to his father, businessman Tibor Fischl, who hid from the Nazis at this Budapest ambulance station, before he was taken away and killed in 1944. Peter Fischl looking at a crematorium oven at Auschwitz. At the Budapest ambulance station museum, Peter Fishchl breaks down, while reciting a short prayer in Hebrew in memory of his father.